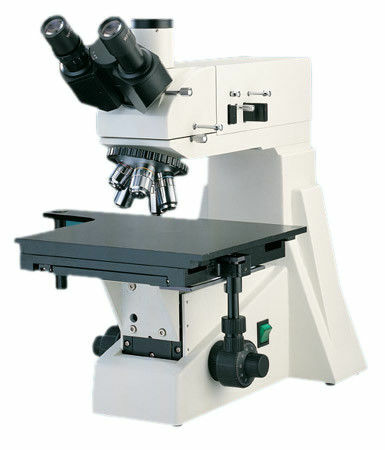 XJL-101/201 Series upright metallurgical industrial microscopes are suitable to observe surfaces of opaque object. It is equipped with Kohler illumination and excellent long working distance plan achromatic objectives and wide field eyepieces, providing excellent optical quality and operational performance. The T type main frame provides outstanding anti-vibration performance and also for the big workpiece observation. The large stage provides fast or slow movement. Stage lifting or objective lifting structure are open for option, in order to fit for the workpiece of different thickness. The XJL-101/201 series upright metallurgical industrial microscopes are with smart design and user-friendly operation, it is the ideal instruments for researching of metallography, mineralogy, precision engineering, electronics, etc. Integrated field, aperture diaphragm and (Y,B,G, ground glass) switching device. The mode XJL-101 is equipped with integrated polarizer and rotatable for 360 °, the mode XJL-201 is equipped with the outside polarizer and rotatable from 0°~90°. Focus system Coaxial coarse/fine focus system with tension adjustable and limit stopper, the minimum division of fine focusing: the mode XJL-101 is 0.7μm and the mode XJL-201 is 2μm.